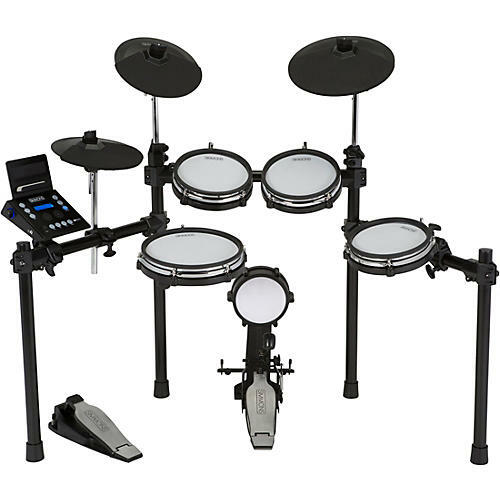 Designed for the drummer who wants a rock-solid electronic drum set for practice, rehearsal and recording, the Simmons SD600 mesh-head kit with Bluetooth is ideal for players who are looking for an acoustic sound and feel, premium features, and the ability to expand, create and connect wirelessly via Bluetooth. The SD600 comes complete with double-layer, tension-able, dual-zone mesh heads, including toms, snare and kick, for incredible responsiveness and realistic acoustic drum feel. The SD600 steel rack allows you to adjust the pads to fit whatever your playing style and setup is. The robust design and solid construction of the SD600 steel rack ensures your kit will stay put so you can focus on drumming. The SD600 sound module includes extra inputs when you’re ready to expand your sound and playing palette with two additional pads or triggers. The module features the Simmons Signature Sound Library for a wide variety of drum voices—as well as percussion and electronic sounds—across 35 preset drum kits, making it ideal for any style or genre. Users can even create and save up to 10 fully customizable kits. With Simmons' advanced V.A.R. (Variable Attack Response) technology, multi-dynamic samples respond to your playing, so your playing experience is immersive and accurate. The SD600 includes a wide collection of great-feeling drum and percussion multi-layered sounds, including multi-velocity, stereo cymbal sounds for a lifelike acoustic sound and feel. Using the free Simmons iOS app, you can wirelessly connect the SD600 sound module to your computer, tablet or smartphone for complete control. This includes sound and performance editing, as well as kit customization. Using Bluetooth or USB, you can tap into a universe of iOS DAW and computer apps like GarageBand® and so much more. Record songs, utilize soft-synth and trigger samples, plus take advantage of an unlimited collection of teaching apps—all at your fingertips.